The Creekside neighborhood is a smaller neighborhood located on the East side of Regina. It backs the Parkridge neighborhood to the North and West and the East Pointe Estates neighborhood to the South. This neighborhood also backs onto the enormous Parkridge Park which has a basketball court, walking paths, benches, a play structure and the Parkridge Park outdoor spray pad. The area also sides up against the smaller Creekside Park. Development for the neighborhood was approved back in 1995 and you will find an even mix of bungalows and 2 storey homes here with a few bi-levels. Almost all homes here are single family with just a sprinkling of condos on the Southeast corner of the neighbourhood. 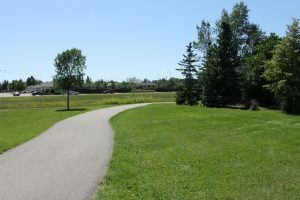 The Pilot Butte Creek pathway is easily accessed from this area as it meanders through both Parkridge Park and Creekside Park. The neighborhood is close to multiple restaurants, shopping, and other businesses located on both Prince of Wales Drive and Victoria Avenue. Many residents here are members of the Dewdney East Community Association. This neighborhood has easy access to the #1 Highway.